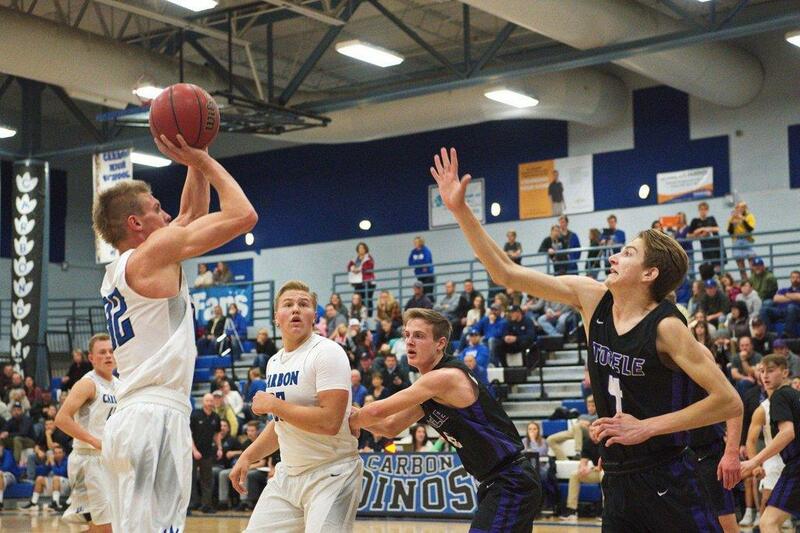 Carbon High was on the road on Tuesday as the team faced off against the Uintah Utes. The Dinos have often taken themselves out of games this young season by falling into early holes. This problem plagued the team again against the Utes. Midway through the first quarter, Carbon was trailing Uintah 9-8 when the Utes went on a 16-0 run that carried them to a 32-13 lead over the Dinos at half. As in the majority of games this year, the Dinos came out swinging in the second half and scored 19 to the Utes’ 10 in the third quarter. Unfortunately, like in previous games, Carbon was unable to atone for their first half mistakes and fell, 59-39. Carbon only turned over the ball five times as a team and had 12 steals, including nine by Collin Lewis. They shot 31% from the field, however, including 16% from beyond the arch. The Dinos will need to improve things quickly as they welcome the Emery Spartans to Price on Friday evening for a rivalry game. This game will be broadcast online under the Live Sports tab at ETVNews.com and on ETV Channel 10 beginning at 7 p.m.